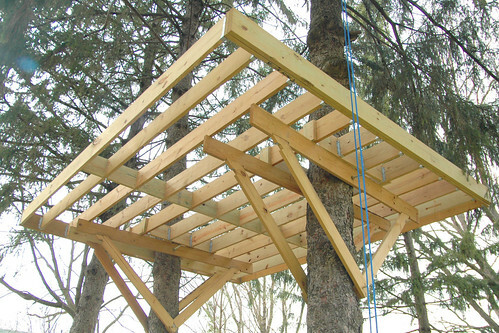 almost ready to put on the decking on The World’s Most Awesome Treehouse(s)! a little more progress on The World’s Most Awesome Treehouse(s)! i made space around the trees with cripple joists, added the remainder of the floor joists and added deck blocking for stability. i think i decided to double up the end joists along the 16 foot side like i did along the 14 foot side for just a little bit more rigidity so i still have that to finish. but after that i’ll be ready to add the decking and then the guard rail and balusters! one big remaining decision – to use pressure treated decking or not? i think i’m leaning towards pressure treated to help prevent decay. i’m thinking that anything i put on unfinished decking to prevent rot is going to be at least as unfriendly as pressure treated lumber. suggestions? here you can see a bit of how i put in the cripple joists to give the trees room to grow while having 16″ on center joists. 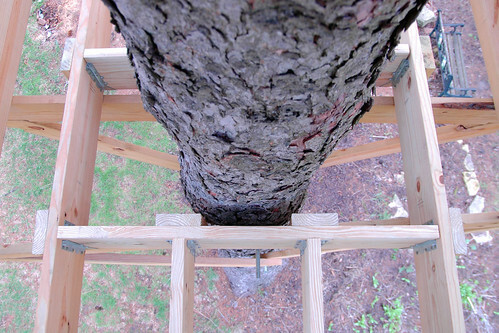 it’s hard not to get a little vertigo looking 12 feet down through the joists! Previous PostSun Emits a Mid-Level Flare by NASA Goddard Photo and VideoNext Postday 3229: lounging about with the chickenpox, imagining Super Awesome treehouse designs. Pingback: snowdeal.org - day 3229: lounging about with the chickenpox, imagining Super Awesome treehouse designs. Pingback: snowdeal.org - how to get a good laugh from a wagon load of amish sawyers.